We took a trip to Gettysburg when my son Michael was in middle school and a Civil War reenactor. With his commentary, we walked Picket’s Charge and learned so much more than facts you learn in school. He explained how we lost a generation of good young men that would have been husbands and fathers. That profound loss and sacrifice reinforces the point that Memorial Day is about understanding, remembering, and paying respect to those that served our country and paid the ultimate sacrifice so the rest of us could enjoy our freedom. Unlike the song, we don’t need another hero, we always need heroes. On this Memorial Day, I want to thank my son, serving the US Army in Afghanistan along with all those serving, and thank their families as well. To walk in their shoes, much like the way we walked Picket’s Charge, is a good way to understand. National Middle School Cadet Corps – a program is designed to introduce middle school students to responsible leadership roles while serving as a bridge facilitating a smooth transition into high school. Young Marines – a youth education and service program for boys and girls, ages 8 through completion of high school. The Young Marines promotes the mental, moral, and physical development of its members. The program focuses on character building, leadership, and promotes a healthy, drug-free lifestyle. The Young Marines is the focal point for the U.S. Marine Corps’ Youth Drug Demand Reduction efforts. U.S. Army Cadet Corps – following the emphasis on youth development which has been targeted by the Department of Defense, the U.S. Army Cadet Corps utilizes the spirit, traditions, and models of the U.S. Army to further the development of America’s youth. The development of body, mind, and spirit are the key elements of this program. These elements are stimulated through close order drill, precision military formations, physical fitness, martial arts, and the privilege of wearing an Army uniform. Skill areas include instruction in both basic military and high adventure training, such as Rappelling and Mountain Climbing; Map, Compass, and Land Navigation; Marksmanship and Weapons Safety; First Aid and Water Survival; and Scuba Diving. Instruction is given in both classroom and hands-on environments. Civil Air Patrol – Cadets fly, learn to lead, hike, camp, get in shape, and push themselves to new limits. If you’re dreaming about a career in aviation, space, or the military, CAP’s Cadet Program is for you. U.S. Army Junior ROTC – Providing a quality citizenship, character, and leadership development program, while fostering partnerships with communities and educational institutions. U.S. Naval Seal Cadets – Through organization and cooperation with the Department of the Navy, to encourage and aid American youth to develop, train them in seagoing skills, and to teach them patriotism, courage, self-reliance and kindred virtues. 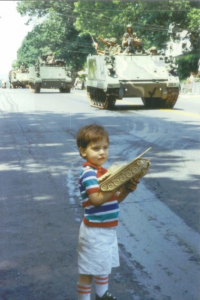 The picture at the beginning of this post is Michael as a little boy celebrating the return of our troops from Operation Desert Storm in Nutley, NJ in 1992. Have a wonderful Memorial Day, and be sure to thank a solider for their service. Businesses use return on investment, or more commonly referred to as ROI, to evaluate the efficiency of an investment. The return is based on tangible investments and benefits. But how does one evaluate the benefits of someone as valuable as your mother? Can you possibly imagine what your life would have been without her to teach you about life, to inspire you, encourage you, give you values, and do those hundreds of things every day that can easily be taken for granted? If you had to hire a mom, the required skill set is overwhelming, and all first time moms come in to the role with no previous experience. The job is 24/7, 365 for the rest of your life, and is often referred to as walking around with your heart outside your body. 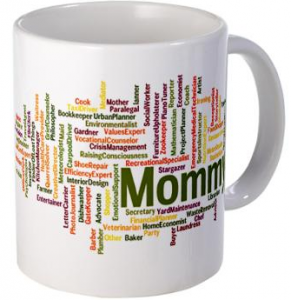 As we celebrate Mother’s Day next week, let her put up her feet and give her a warm cup of coffee. She deserves it! To all you amazing moms out there, have a wonderful Mother’s Day!